Fanatics is a leader in sports apparel, and their hat collection is no different. To let you know how awesome their brand is, we're highlighting one of our favorite items as the centerpiece of a game day look. 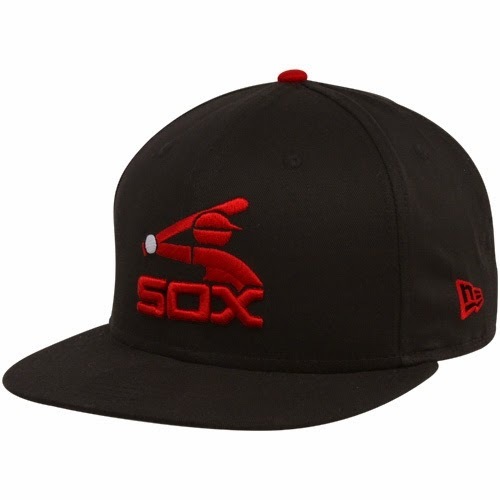 We love this vintage Chicago White Sox hat for so many reasons. The throwback logo is timeless. It's still a favorite for many Sox fans. The hat also represents Chicago well-- classic, stylish and bold. To complete our game look, we added a striped peplum top, black scarf for these unpredictable September days, black jeans, and a "We Wear Black" bracelet, giving a nod to the Sox motto. To add a pop of color to the canvas color scheme, we paired Pedro Lourenco lipstick by MAC, red flats, and Blanc nail polish by Essie. A cocktail ring and hoop earrings are staples. With this look, you're ready for any home game Comiskey Park (U.S. Cellular Field) throws your way! Check out Fanatics for this classic hat, and a bunch of other pro sports styles for your wardrobe!